This is a repost of a recent DevPortal post. It turned out that lot of SmartBots developers missed that post, so I decided to repeat it here once more. This is the most important update which relaunches your scripts if Playground server gets restarted. This is the most popular resolution for compact laptops, so we refined page controls: script rename/remove links has been changes; long script names are properly displayed now. Reference links to Playground Commands and Events have been added. 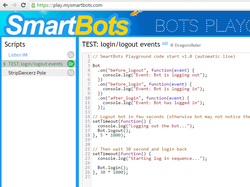 We welcome all developers to try Playgrounds and discuss it in DevPortal forum! 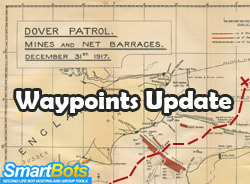 Waypoints just got even better! We’ve just updated a Waypoints Navigator module (this is the module which allows writing a simple step-by-step walk-and-talk instructions for your bots). finally, the pause option has been added (you can pause your waypoints execition at any time).